If you are a restaurant owner or manager, your goal is to attract as many clients as possible. So, you have to encourage people to come to your restaurant when they plan eating out. This is much easier to do if your potential clients have your restaurant at the forefront of their minds. This is where an automated email marketing system like EasyMail7 comes in. By sending emails with the information about your current menus, specials, discounts, and deals directly to your regular clients’ Inboxes, you will make people think about your establishment and encourage them to come back more often. Well, if you send your marketing messages without permission, then it is spam, but if you get the clients’ consent to email them, then it is not. It is rather easy to get the client’s permission to email them your news and offers. Just ask them. 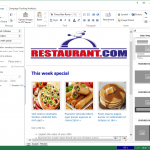 Many of your existing clients will welcome receiving regular emails about your restaurant. Those who gave you their permission go to your subscriber list, which will receive a series of emails about your business. How to ask them to subscribe? The old good method is to have a subscription form on your restaurant’s web site where you ask visitors to enter their email address and name and opt-in to receive news and offers from you. You can also ask clients to subscribe to your list when they book online and add an email subscription form to comment cards you give to diners with their checks, on your menus and with take away orders. EasyMail7 was designed to make email marketing simple and easy so it allows you to send out stunning email newsletters on auto-pilot. Everyone who subscribed to your list want to receive news and offers from you. What is great about this in-house email software is that after a new subscriber joins your list, they automatically receive the emails you have already written. There is an amazing time saving here because you design the emails once, schedule them to be sent at the desired intervals and then EasyMail7 sends the emails out to everyone who signs up, without any subscriber being missed out. By sending a series of automated emails you can nurture a growing base of customers and this will help you increase your income. Regular customers will bring you new clients as they can recommend your restaurant to friends, colleagues, and relatives. In addition to automated emails you can send individual messages when you have something important to say such as introducing a new menu or a seasonal offer. EasyMail7 was designed for everyone who wants to use email marketing so it allows you to create a beautiful HTML email without having deep HTML skills. 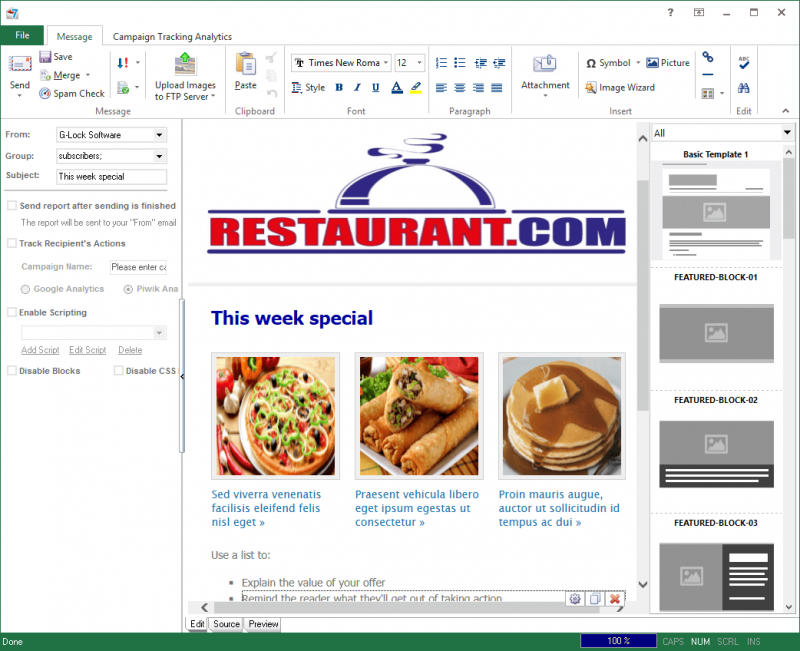 You can drag and drop default email template to the editor, insert pictures of your food to the template, write about your offer to tempt clients back again and send the email. You should not rely on the hope that your clients will come back on their own. Instead use email marketing to push them gently to have them return again and again. You can also use email marketing to ask for feedback, send quick polls and surveys to find out how your clients like your restaurant and food. You will likely to get some ideas on how you could improve your service and menus.